started improving the inclusivity of their teaching right now. 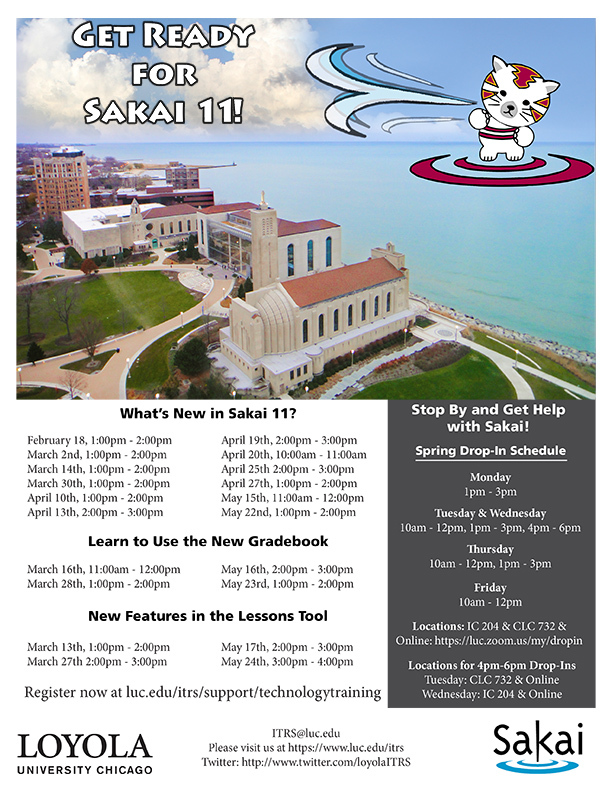 Throughout the day, outside Wintrust Hall: ITRS staff will be on hand to address your questions about Sakai, TopHat and other technologies. Experience and learn inquiry-based learning techniques to support reflection. Explore interdisciplinary opportunities through the integration of artifacts and artwork into student reflection. Become more familiar with LUMA and May Weber collections, as well as receive faculty resources for upcoming LUMA exhibits - [italics] Misericordia: Together We Celebrate; Peter Gelker: Whirligigs; and Wayang: The Art of Indonesian Puppetry. Program Description: Artifacts and works of art provide inspiration and fresh points of entry into the reflection activities that are critical for students' learning experience at LUC. In this session, participants will explore Loyola University Museum of Art (LUMA) exhibits and the May Weber Collection as a resource for reflection across the disciplines. These collections and exhibits are available to faculty as teaching and learning resources, both in the gallery setting as well as in the classroom as visiting objects or online images. Session participants will engage in inquiry-based activities that support reflection on social justice themes, such as diversity and difference; identity and community; and giving and receiving. Participants will have the opportunity to consider what connections they can make between their course materials and the rich collections and exhibits offered on campus, opening up their students to this engaging avenue for reflection. Discuss a range of faculty (or staff)/student mentoring opportunities, addressing both best practices and challenges in effective mentoring. Consider how the mentoring experience may adapt Ignatian pedagogy to support a student's formation as a principled leader. Provide suggestions for reflective self-assessment for the faculty or staff member engaged in the mentoring experience. Program Description: Faculty and staff mentors teach new skills, offer personal guidance, and act as role models for their students. Indeed, building a meaningful mentor relationship may be one of the most transformative experiences possible during a student’s university career. One-on-one mentoring represents an opportunity for Jesuit university faculty and staff to engage in the knowledge-sharing partnership between student and instructor supported by Jesuit education.This session outlines a range of faculty/staff-student mentoring opportunities and considers how these experiences may purposefully use Ignatian pedagogy to support a student’s formation as a principled leader. Discuss ideas to create community for students participating remotely. This session is intended to provide a forum during which participants can discuss and share ideas about the knowledge adult learners’ bring to the classroom and how to create the feeling of community to increase student success. 1. Faculty will discuss how making their teaching relevant to the current state of American racial relations can become politically controversial despite adhering to best disciplinary/pedagogical methods and practices. 2. Faculty will brainstorm on best disciplinary/pedagogical practices in relation to the "post-truth" paradigm of contemporary American political culture. I will discuss how my efforts to recruit African American students for my Hist 300: Slavery and Abolition: Then and Now course became a target for right-wing attempts to shame/silence/intimidate faculty via on-line exposes on conservative sites. Following this targeting, my name was placed on the “Professor Watchlist.” I will also discuss the course itself and how it struggles against the “violence of forgetting” in regard to slavery’s racist (both structural and overt) legacies in contemporary America. Part of the talk will also focus on how the acceleration of America’s decline into a ‘post-truth’ political culture, a decline brought on by the Trump campaign, has intensified the link between the violence of forgetting and political violence (rhetorical and physical) itself. 1. Discuss the potential benefits and costs of addressing subjects of contemporary political controversy in class. 2, Faculty will consider different ways to reconcile strong commitments to particular causes with openness and respect for different opinions. I will share some of my experiences of tackling subjects such as climate change, immigration policy, and economic questions that are the subjects of both academic inquiry and of contemporary politics. On the one hand, these questions are important in their own right, and their incorporation underscores the relevance of history and other disciplines. On the other hand, discussing them can risk simply activating pre-existing beliefs and commitments and alienating students whose views may be at odds with those of a professor or the majority of their classmates. Due to a scheduling conflict for the presenter, this session had to be cancelled. Sorry for the inconvenience. Session Description: Faculty often focus on the issues dealing with the difference among international students and the cultural issues that impact their learning here at Loyola. But what about the students’ experiences? This session is designed to allow us to hear from some international students regarding their experiences and then discuss the implications of those experiences for classroom practice. Articulate the theory and research on learning portfolios as it relates to Ignatian Pedagogy. Identify learning portfolio best practices in curricular integration. Apply best practices on learning portfolio integration to their course. Program Description: Learning portfolios (ePortfolios) were recently added to Dr. George Kuh’s High Impact Practice list where they joined service-learning, undergraduate research, diversity/ global learning, internships, and others that are practices focused on deep learning, critical reflection, and creating integrative experiences for students. This session will capture the movement and synergy built around learning portfolios now nationally and bring it to Loyola locally. This session focuses on two primary goals: 1) understanding the theory and research behind learning portfolios as it relates to Ignatian Pedagogy and 2) practical application on integrating learning portfolios into curriculum. Provide resources recently published by The Council of Social Work Education (Craig, Alessi, Fisher-Borne, Dentato, et al., 2016) that examine 1) institutional equity; 2) recruitment, admissions, and retention; 3) inclusive and affirming staff and faculty training; 4) inclusive and affirming explicit curriculum; 5) inclusive and affirming implicit curriculum; and 6) inclusive and affirming field education experiences for LGBTQ students, faculty and administrators. The challenges and inequities of gender, sexual orientation, gender identity and gender expression on campus (locally and nationally), including potentially increased threats of sexual violence and the need for safe spaces. Policies and strategies for creating a more inclusive environment for all students, faculty, and staff, especially regarding gender, sexuality, race/ethnicity, and class. Pedagogical strategies for creating spaces that promote productive learning for all students. Learner will be able to define interprofessional education and collaboration. Learner will be able to appreciate the need for interprofessional collaboration during clinical training. Learner will be able to understand different methods of training in interprofessional education and collaboration. Program Description:Case based learning and team-care for health professionals could be effective and efficient. Patient care conferences lead by hospital psychiatry team and attended by different team members including nurses, social workers, physical and occupational therapists is a great opportunity for medical students in interprofessional education. Come and learn how to gain experience in interpersonal collaboration and how interpersonal collaboration improves the quality and safety of patient care. Murali Rao, MD, FAPM is a Professor and Chairman, Department of Psychiatry. Aparna Sharma, MD is the Director of Psychiatry Residency, Dept of Psychiatry. Nitin Thapar, DO is a 4th Year Psychiatry Resident in the Department of Psychiatry. Summarize the purpose of each tool. Choose the appropriate tool(s) based on learning objectives of a course. Program Description: Loyola provides various instructional technology tools (Adobe Connect, Loyola Media, Panopto, Top Hat, VoiceThread, and Zoom) that allow instructors to design high-quality interactive courses. Exploring all of these tools can be time consuming. Let us help you out as we run-down the different tools available at Loyola. During the session, we will move through the different technology tools that are available for use. 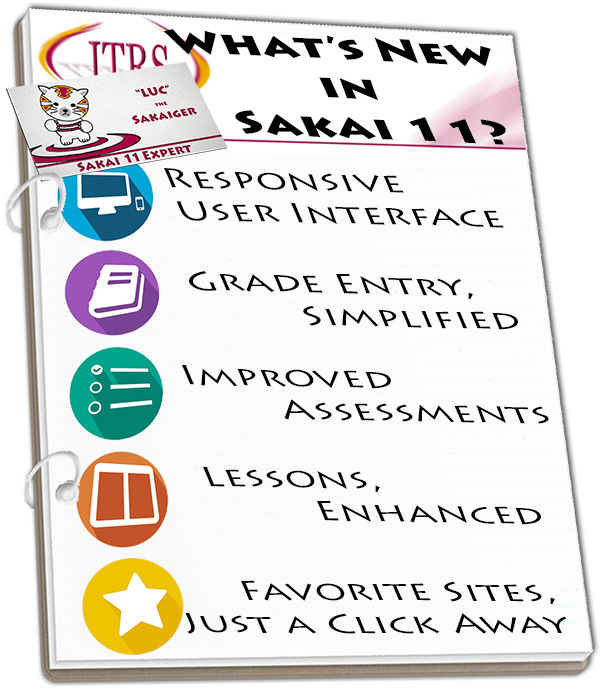 We will explain their purpose and provide an example of how other instructors are integrating them into Sakai. Come learn about all the options you have to enhance your learning outcomes! Part 1: Bridget Wesley and Robyn Mallett—“Mobilizing staff, faculty, and students for Justice” How Mobilizing for Justice was born, who is involved, what are the goals, and how others can become involved. Part 3: Robyn Mallett and Bridget Kelly--“Helping Students Understand Bias and Inclusivity” We reveal the new UNIV 102: course objectives, content, where to go from here. Be able to identify three themes from Catholic Social Teaching (CST) their subject material touches on. Be able to see how CST's "common vocabulary" approach can be helpful especially in the Experience, Reflection, and Action pieces of Ignatian pedagogy. Be able to identify the five steps of Ignatian Pedagogy. Program Description: As the new strategic plan encourages us to "build a more just, humane and sustainable world," it can be tricky to see exactly where concepts of social justice can fit into your work. Come to this session to learn about how incorporating Ignatian Pedagogy and Catholic Social Teaching into your curriculum can enliven your course material and classroom setting, while spurring students on toward civic engagement and working for the common good. The presentation will also highlight the project based model of service learning as a unique opportunity to do so at the end. Define the “flipped classroom” approach to face-to-face instruction. Describe gamification as a strategy to enhance classroom learning. Discuss the design and development of the gamified learning environment. Identify lessons learned from student evaluation and instructor experience in engaging the students through the use of gamification. Gamification is an instructional approach that facilitates learning and encourages motivation through the use of game elements, game mechanics, and game-based thinking. Gamification integrates elements from games such as earning points, overcoming a challenge, or receiving badges for accomplishing a task. Gamification also engages the learner in a unique way to further learning outside the classroom. This workshop will review gamification strategies that were used to support out-of-class learning in a flipped classroom approach for a sophomore community health nursing course. Course assignments and corresponding gamification elements will be discussed. Student use, impact on learning and administration of the gamification elements will be presented. Lessons learned from course modification, implementation, evaluation and ongoing development will be identified as well as next steps in the process of using gamification strategies in future course development.